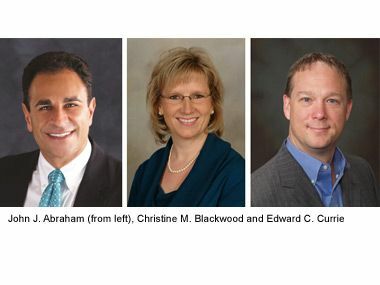 Associated Bank mortgage loan originators, John J. Abraham, Christine M. Blackwood and Edward C. Currie were recently recognized by Scotsman Guide, for their mortgage lending performance in 2011. In addition, Currie was recently recognized by Mortgage Executive Magazine. Currie ranked nationally as the 38th top producing mortgage professional of 2011. Abraham, Blackwood and Currie were ranked among entries from more than 800 mortgage professionals across the country. To be eligible for initial consideration in Scotsman Guide's Top Originators rankings, originators must have had at least $30 million in loan volume or 100 closed home loans for the 2011 calendar year. Only loans and volume that originators closed personally could be considered. After receiving submissions, Scotsman Guide required written verification of top entrants' volume from a certified public accountant, the chief financial officer at the originator's company or a similar source. This verification process makes Scotsman Guide's Top Originators list the most accurate ranking of top-producing originators in the industry.